The Posmen were a band from Ocala, Florida. They were all students at Lake Weir High School. 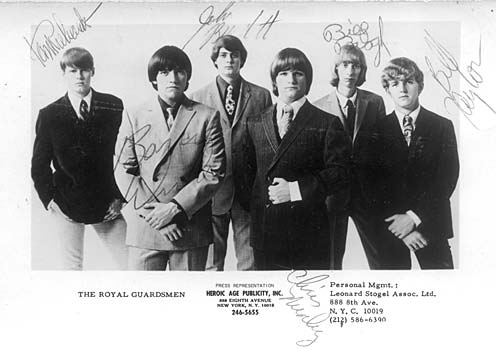 With the British Invasion, they decided to change their name to the Royal Guardsmen, giving themselves a British sounding name. When their debut single, “Snoopy Vs. the Red Baron,” became a hit single late in 1966, they began touring. The band consisted of Billy Taylor on organ, Tom Richards and Barry Winslow on guitar, drummer John Burdett, bass player Bill Balough and singer Chris Nunley. Their first single, “Baby, Let’s Wait,” climbed to #11 in Sarasota, Florida in the fall of 1966. They recorded “Snoopy vs. the Red Baron” which became a #2 hit in the US and a #1 hit in Vancouver. Initially, the Royal Guardsmen got into legal trouble with their records about Snoopy since they hadn’t got permission from Peanuts cartoonist, Charles Schultz, to use Snoopy and the Red Baron in their songs. 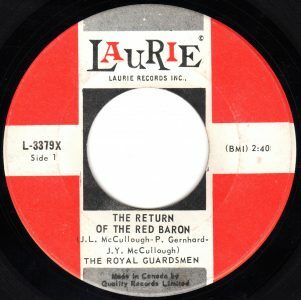 Nonetheless, Vancouver got hooked on the Royal Guardsmen sending their follow-up single, “The Return of the Red Baron,” to #2 while it only peaked at #15 in the USA. “The Return Of The Red Baron” picked up the story of Snoopy and the Red Baron and their feud. The song begins with the Red Baron vowing to avenge the loss of his plane that burned in flames after Snoopy shot him down in “Snoopy vs. the Red Baron”. The Red Baron looses his cool and fails to aim steadily when firing at Snoopy. But Snoopy is “cool” and by the end of the song Snoopy is gunning for the Red Baron. The band released a third Snoopy-themed song titled “Airplane (My Airplane),” which was a #1 hit in Orlando (FL), Stevens Point (WI) and Worcester (MA). Though the song never had a national breakout in America, though it went Top Ten in New Zealand, South Africa and Australia. Their fourth Snoopy-themed single was a Christmas song. It was listed on the Billboard Christmas song list, but didn’t make the Billboard Hot 100. “Snoopy’s Christmas” was about a dogfight Snoopy had with the Red Baron in their First World War biplanes. At one point, the Red Baron has Snoopy outmaneuvered. But instead of shooting Snoopy’s biplane, the Baron forces Snoopy to land behind the German lines. Snoopy thinks it’s over for him. But once they are on the ground, the Red Baron calls out “Merry Christmas, mein friend.” The Baron offers Snoopy a holiday toast. While the Royal Guardsmen were serious musicians, Laurie Records kept giving them more Snoopy songs to record. When they performed in concert they’d play their Snoopy set: “Snoopy vs. The Red Baron,” “The Return Of The Red Baron,” “Snoopy’s Christmas,” “Snoopy For President” and “Airplane (My Airplane).” “Snoopy For President” was released the week that Robert F. Kennedy was assassinated and few were in the mood for poking fun at politicians who ran for president in that context. In 1969, one of their last songs was “The Smallest Astronaut,” was about Snoopy flying a decoy space ship in order to help the American’s win the race to land on the moon. The end of the song featured spoken word roll call of the surnames of the American astronauts who were part of the space race: Aldrin, Armstrong, Collins, Stafford, Young, Cernan, MacDivott, Scott, Schweikert, Borman, Lovell, Anders, Schirra, Cunningham, Eisell, Grissom, White, Chaffee, Cooper, Carpenter, Glenn and Shepard. The band was losing members by 1969 and broke up in early 1970. Tom Richards died in 1979. For decades they didn’t play again, but in 2004 they had a reunion at Lake Weir High School with the original five bandmates and In 2006 they performed on an oldies cruise ship. And in 2010 they had a third reunion in Las Vegas. This time is was at the invitation of KKLZ radio’s End of Summer Bash. The Royal Guardsmen were in a lineup with Jimmy Gilmer and The Fireballs of “Sugar Shack” fame, Eddie (“Hey There Lonely Girl”) Holman and The Vogues at the Cannery Hotel and Casino. Over the past decade Billy Taylor has been the mandolin player for Backwater, a bluegrass band based in Ocala. Dave Schlenker, A Royal Reunion, Ocala.com, September 4, 2010. Sam Roberts, Luigi Creatore, Songwriter and Producer for Presley and Sam Cooke, Dies at 93, New York Times, December 15, 2015. Gillian Brockell, The Christmas Truce Miracle: Soldiers Put Down Their Guns to Sing Carols and Drink Wine, Washington Post, December 24, 2017. David Laing, George David Weiss Obituary: US Writer of Many Memorable Hit Songs, The Guardian, London, UK, August 24, 2010. Star of Broadway’s HELLAZPOPPIN, June Winters, Dies at 96, Broadway.com, New York, NY, September 8, 2015. CKLG Boss 40, CKLG AM 730, Vancouver, BC, March 11, 1967.